This 3 page black and white set of printable addition flash cards has 0 as the first & second addend with sums up to 10. They're easy peasy ... all the answers are the number added to 0! 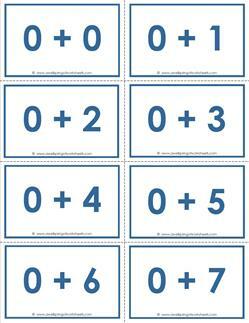 These blue printable addition flash cards for 0's have 0 as the first and second addend. You're in store for some easy practice where all the answers are the number that is not the 0! Adding one is fun because the answer is always the next higher number. 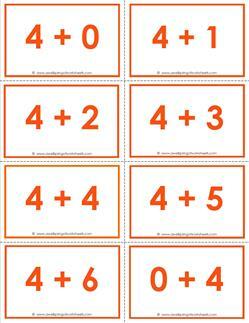 My printable addition flash cards for 1's have the 1 as the first and second addend. 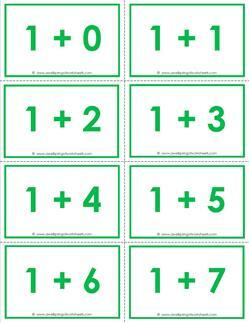 This 3 page set of printable addition flash cards comes in a pretty green. The 1 is used as the first addend and second addend for comprehensive practice. Sums up to 10. Plain Jane in black and white, these printable addition flash cards for 2's are 3 pages long. Print and send home in homework packets for extra practice at home. 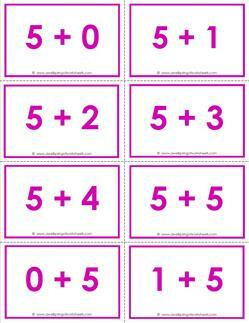 These 3 pages of printable addition flash cards for 2's come in a pretty raspberry color. 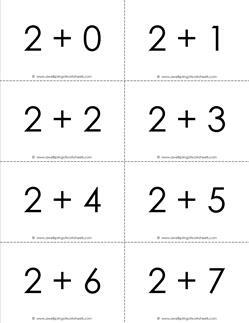 A treat for the eyes and a treat for little ones learning their addition facts for the first time. These black and white printable addition flash cards for 3's come in a two page set. 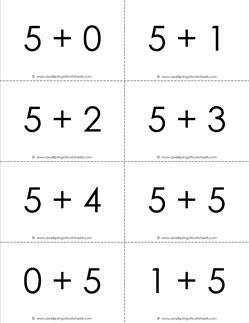 Get good at adding by practicing addition facts for 10 minutes every day. 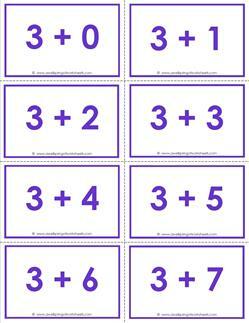 Pretty in purple, my printable addition flash cards for 3's are a two page set. Use in your math center times. Write the answers lightly on the back and have kids test each other. 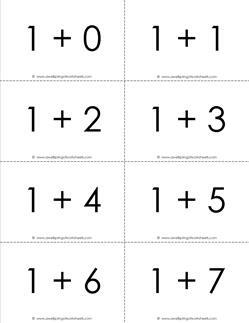 This 2 page set of printable addition flash cards for 4's comes in simple black and white. Use for drill and practice. Make it fun though by timing yourself! This set of 4's addition flash cards turns out to be the lucky ones in this pretty pumpkin spice color. Two pages of flash cards with sums up to 10 for thorough practice to become an addition wiz. Keep it simple Sam. Show me a set of black and white flash cards that won't eat up all my printer ink... Here you go! Addition flash cards for 5's with sums to 10. Two pages of ten addition flash cards for 6's in no frill black and white. Practice once, twice, then three times. Then keep practicing until you know them by heart! Two pages of ten addition flash cards for 6's in no frill black and white. Practice once, then twice. Then keep practicing until you know them by heart! 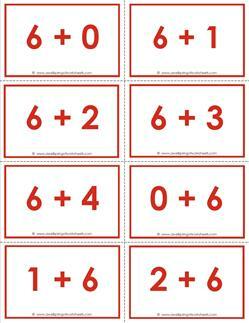 In ruby red, this fine two page set of printable addition flash cards of 6's comes your way to make your day! Think Dorothy's shoes... The joy of using this set of flash cards and no other. Only one page, these addition flash cards for 7's come in plain ol' black and white with sums up to 10. Give 'em the good old kinder try! You can do it! 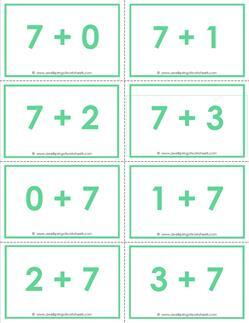 Addition flash cards of 7's with sums to 10 in a gentle seafoam green. Cut this one page set apart (laminate for stronger cards) and use at center times for addition practice. It may not look like you're getting much with this set, but there are only a few ways to add with 8 to get up to a sum of 10. Black & white addition flash cards. 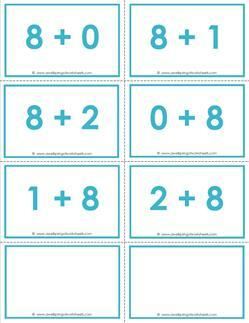 One page of addition flash cards for 8's in a soft baby blue. An 8 is used as the first and second addend in this set of flash cards. Only a few problems needed to get sums up to 10. 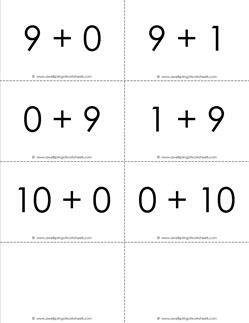 The 9's and 10's are combined in this black and white set of addition flash cards with sums up to 10. Adding 1's and 0's is the only way to get to 10! This color set of addition flash cards for 9's and 10's come in a powdery sort of blue. 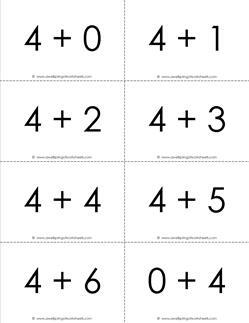 One page of addition problems that add up to 10 or less. Perfect for kinder or first. 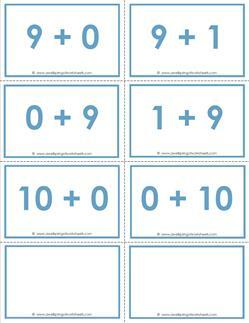 This is a complete set of addition flash cards for numbers 0 - 10 that make a sum of 10 or less. Comprehensive, nine pages in black & white. 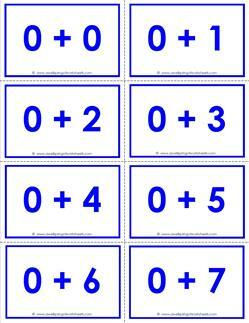 A complete set of addition flash cards for numbers 0-10 in a pretty blue. All addition problems equal a sum of 10 or less. Great for kinder or first grade!